Visual (front-end) performance can be just as important as search speed. Controlling animations, Javacript files and stylesheets can greatly improve your overall site performance. The plugin offers lots of tweaks to optimize visual performance to your need. On the Advanced Options -> Animations panel you can control both Desktop and Mobile device animations separately. Adjust the Settings drop-down, Results drop-down and Result items animations to your needs. Desktop browsers usually have great performance, so they should be able to handle animations well. 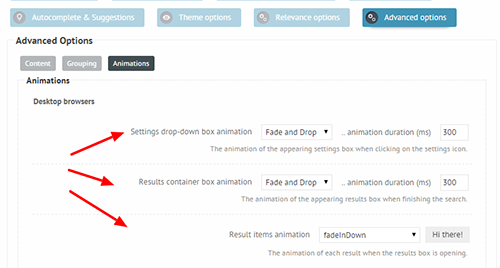 If your site already has lots of animations (slider plugins, other visual elements), then you should consider turning the animations on this settings page. Also, please note, that mobile browsers and devices vary greatly in performance, so choosing no animation is usually the best idea. By default the Load scripts in footer option is turned ON and I recommend leaving it that way. If the scripts are loaded in the footer, they won't block the site rendering process = faster page loads. By default the plugin loads every script to give as much freedom to you as possible. In most cases however you won't use some of the functions the plugin offers. In this case you can turn off some of the scripts to have more performance. Are you using the Isotopic layout? If not, turn off the Load the isotope JS option. Are you using the Polaroid layout? If not, turn off the Load the polaroid gallery JS option. Are you using Custom Field filters and sliding bars? (probably not) If not, then turn off the Load the NoUI slider JS option. This option was mainly designed because of the popular themes aggressive style sheets. Unless you are having issues, I recommend leaving it on Medium. You can try Low as well, and if the layout of the plugin does not break or change, then it works. If you are having issues with the layout try the High value. It will try to override the most agressive CSS rules as well. directory on your server. The permissions should be 775 or 755. Turn this option ON if you experience issues with the plugin styling or layout. 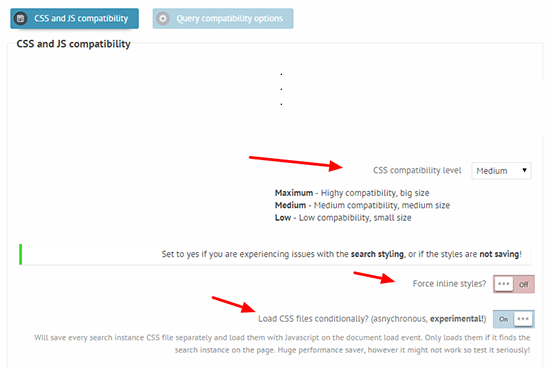 I recommend this option to sites having lots of search instances created or having lots of other CSS files loaded. Only loads the files for the search instances on the actual page. If there is no search on the page, no stylesheet is loaded. Greatly affects the site load performance, as the CSS files are loaded asynchronously on page load.